Alvaro Arenas is an innovator, researcher, technology fan, Professor of Information Systems, and Director of the Department of Information Systems and Technologies at IE Business School. He holds a M.Sc. and a D.Phil. in Computation from Oxford University, as well as a B.Sc. and a M.Sc. in Systems Engineering and Computation from Universidad de los Andes, Colombia. Alvaro´s main research interest lies in trust and security in distributed information systems. In his view, “the globalization of business requires the interoperation of systems between enterprises; but there is a resistance to such interoperability due to a lack of trust of alien systems, and a reticence to expose corporate systems to new risks – especially security risks”. Alvaro´s research work has focused on tackling this challenge by applying trust and risk management techniques in order to secure distributed collaborations. His research has been published in a number of top tier academic journals. Highlight of some of his research work includes models for reputation management in service computing; trust management in virtual organizations and business collaborations; security requirements for large-scale distributed systems; and usage control in business processes. Alvaro has been active in the European Research Area. 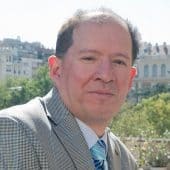 He is currently a member of the Scientific Advisory Board of the EU Contrail project and leads the topic of “trust and security in large-scale distributed systems” within the ERCIM CoreGRID Working Group. He was the scientific coordinator of the EU GridTrust project, led the security work in the EU XtreemOS project, and the Virtual Organization Management work in the EU TrustCoM project. Before joining IE Business School, Alvaro was a senior research scientist at the Science and Technology Facilities Council (STFC) in the UK, leading the Distributed Systems Team at the STFC e-Science Centre. Previously, he was Head of the Information Technology Group at the Universidad Autonoma de Bucaramanga in Colombia.